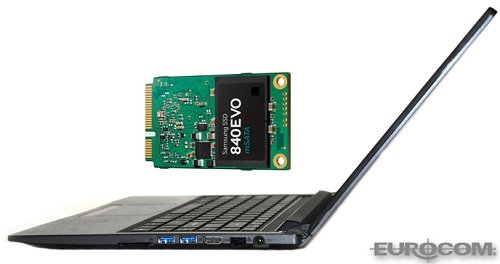 Eurocom is now offering 2 TB of storage in its new Armadillo Ultrabook. The 1 TB mSATA SSD Samsung 840 EVO storage drive allows Eurocom customers to configure their Armadillo Ultrabook with up to 2 TB of SSD storage by combining a standard 7 mm storage drive with an mSATA Solid State Drive for massive amounts of high quality storage in an ultraportable package. With the convenience of a tablet and the capability of a laptop, the 14” EUROOCM Armadillo is built for the new age of power user. Weighing just two kilograms and being 22 mm thin makes the EUROCOM Armadillo extremely easy to carry anywhere, with no need for a power cord due to 9 hours of battery life. The new 840 EVO mSATA SSD utilizes Samsung's advanced 128 gigabit (Gb) NAND flash memory based on 10 nanometer process technology. The 1TB Samsung Evo mSATA SSD comes in a thickness of 3.85 millimeters and a weight of 8.5 grams, which are approximately 40 percent and a twelfth of a typical hard disk drive (HDD) respectively. “This is the largest and fastest and smallest removable storage device available on the market and we are happy to offer it to our customers in their new, custom built Eurocom system” Mark Bialic, Eurocom President. The 1TB 840 EVO mSATA SSD offers 98,000 random read and 90,000 random write IOPS (Input Output Operations Per Second) , as well as sequential read and write speed of 540 megabytes per second (MB/s) and 520 MB/s, enabling complex multi-tasking for advanced users. The 1 TB 840 Samsung EVO mSATA SSD is available in all Eurocom models that support mSATA storage devices.